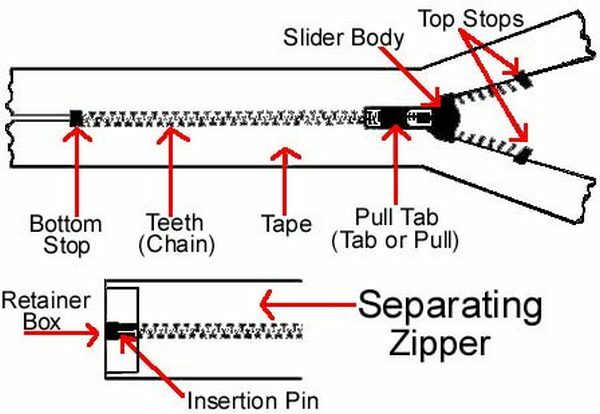 It is a fastening device operated by means of two parallel rows of plastic or metal teeth on either side of a closure that are interlocked by a sliding tab is called zipper. Here, the teeth are carried in two zip fastener tapes which run the length of the zip and which are usually stitched into apparel and other textile products. It is an essential part of garments which is widely used in garments manufacturing sector. It can be used in functional or decorative purposes. It may be different in types and sizes. The function of one zipper is different from another. This type of zippers is widely used for making the skirts of women. It is widely used for making the garments of men, women and children. There are also some zippers which are provided with two sliders used for long coat or garments, but specially used for the large suitcase. It is a narrow fabric which has a high lateral strength and may be knitted or woven, being so constructed as to provide at one selvedge. For the suitable embodiment of the fastener elements is called zipper tape. It’s produced by cotton, polyester, nylon or blended fibre. It is attached by sewing with the garments. Teeth are made of brass, aluminum, nylon or plastic. It is opened and closed by these teeth. Slider is used to open and close the zipper’s teeth or chain. Slider pin or teeth is used in the slider which keeps the slider from the unwanted movement. Stopper controls the slider run out of the zippers. How can collect this products? Highly n excellent, buy the products for manucacturing readymate garments.